Before the war, Messaoud Naoun and his wife Alice (née Cohen) lived in Paris with their eight children; Stella (b. 1922), Vega (b. 1924), Uranie (b. 1925), Hélène (b. 1927), Yolande (b. 1928), Irma (b. 1930), Chantal (b. 1931) and Claude-Alfred (b. 1938). In October 1940, when the Jews in the capital were ordered to register at the municipality, Messaoud decided not to show up. Instead, he and Alice falsified their identity cards, transforming the family name from Naoun to Naour. In November 1942, after the round-up of Jews in Paris and the arrest of most of their friends, Messaoud and Alice decided to send their children away from the capital. With the help of a nun from the order of St Vincent de Paul who was taking care of Messaoud's chronic medical condition, their two younger daughters, Irma and Chantal, found shelter in the south of the country. Their older sister Stella brought them to Saint Fulgent des Ornes ( Orne) ; Chantal was sent to the Label family; and Irma to Albert and Juliette Chaussée. The Chaussées had three children and owned a farm. They welcomed Irma into their home with great love and affection. They knew about her real identity, but never hesitated to take care of her. She was treated as one of their children and took part in all the family celebrations. She went to the local school where she saw her sister; they both learned in the same class. The neighbors were told that Irma was from Paris, and had come to live with the Chaussées because of the lack of food in the capital. Despite the great risk that Albert and Juliette took giving shelter to Irma, they never asked for any kind of compensation, and even gave food to Alice every time she came to visit. After the war, the Naoun family was reunited. Contact between Irma and her rescuers continued for many years. 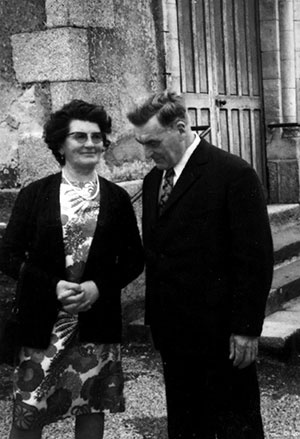 On February 16, 2011, Yad Vashem recognized Albert and Juliette Chaussée as Righteous Among the Nations.